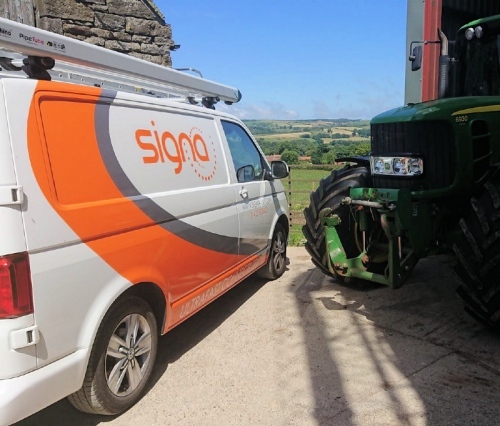 UK ISP Signa Technologies (Moorsweb) informs ISPreview.co.uk that their fixed wireless broadband network has been extended to cover more rural homes on the remote North Yorkshire Moors. Customers can expect download speeds of up to 30Mbps (10Mbps upload) and there are plans for a 100Mbps service. A fresh injection of private investment has enabled the operator to improve their coverage so that residents in the communities of Baysdale, Kildale and Lonsdale are now also able to benefit from their superfast wireless connectivity. Packages typically cost from £20.40 per month for an unlimited 10Mbps package and rise to £39.60 for the top 30Mbps option. A £200 one-off installation fee is also required. On top of that Signa said they had become the first Fixed Wireless Access (FWA) provider to receive a new Quality Accreditation from the UK Wireless Internet Service Providers Association (UKWISPA), which was only launched in September 2018 (details). Apparently the latest network expansion will be rolled out over the next couple of weeks. Locals who struggle to get more than 2Mbps on their current fixed line service may also be eligible for the Government’s Better Broadband Subsidy Scheme to help cover the setup costs, but you’ll need to be quick as this is due to close at the end of 2018. Whose technology are they using, also is it just 5.8GHz or are they using microwave links and possibly 60GHz? We use various vendors and frequencies. Ubiquiti 5GHz mostly for client distribution, Ceragon, Siklu and Mikrotik for backbone using 60,70 and 80GHz connected to Gigabit fibre backhaul. Well done regarding the increased coverage for premises in North Yorkshire but is WIFI resilient enough for emergency regarding remote working?. I would have thought a local CB Radio community would still be more practical over mobile or WIFI both technically and response away from a tractor/vehicle. We inform our customers they shouldn’t rely on a single form of telecommunication system for emergency communication. This is merely a service that they didn’t have before and is an additonal form of communication available to them when using picocells or WiFi calling. Saying that, our network does have battery backup systems in place as well as multiple internet connections for redundancy and resilience. It is also worth noting the majority of radio equipment we use isn’t ‘WiFi’ based.